EURUSD: Upper momentum is still there, however we do see some uncertainty so a reversal is possible today at this level. 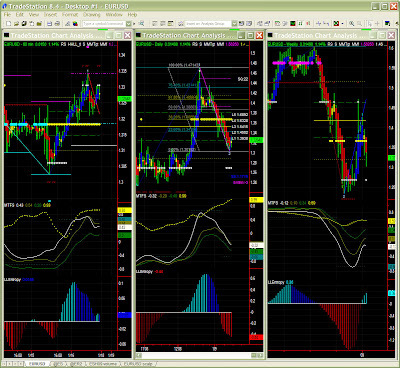 We knew this is a retracement trade on the daily chart with moderate potential in the short term. ER: Overbought and on a Fib resistance level, a retracement would be in order. If ER passes this level (~460), an Expansion pattern is likely to form with a target close to early Jan highs. Should this scenario prove incorrect (always possible, even if unlikely), S&R (Stop&Reverse) levels would be 445 and/or 437. ES: Same story here, however if we take correlation with ER into consideration, we see that the retracement is almost inevitable even if the underlying trend will remain intact. There is still some upward momentum in the short term, then a retracement to 843, or maybe down to 832 will be necessary. On the daily chart, while a Fib Expansion pattern is forming, it is also clear here that it is not going to be a smooth ride still. BCE cut 50bp to bring key rate down to 2%, and this incidently happened on a pivot level for EURUSD. Technically, despite yesterday's volatility, we're not far from prices a day earlier but we can notice a change in dynamics. 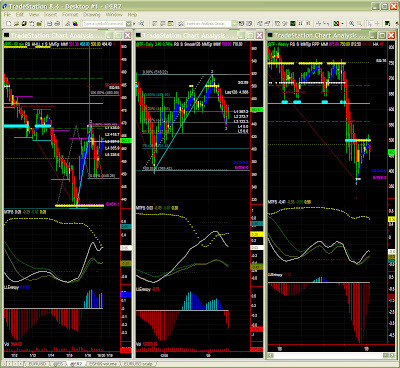 Again the current setup is relatively range-bound and can send prices either down to 1.24 or back to 1.40. We'll check 1.315 on the down side, and 1.332 on the up side. ER: We would like to believe 437 (target given yesterday) was the support level we were looking for. That may be the case, but some profit taking is inevitable (steep swing on the 60mins chart, and bearish pattern isn't complete on the daily chart). Today may show some uncertainty but things should settle within a few days, and we should then see prices rising to 467, 488 and then attack 500 again. ES: Exact same story here, with some hesitation on the daily chart, but we should eventually see 862, 875 etc. In the short term it is clear that we need to see prices holding above 844 otherwise some profit taking will be quite in order. Eh eh... yesterday's quick report at the airport was spot on, wasn't it ? ES used the former 875 support as a resistance to then trigger substantial selling. EURUSD hovered around same price range as expected, with also a negative bias. However, BCE will announce a much anticipated rate cut today which may slow down current dynamics. EURUSD: Relatively directionless in short time frames, with some remaining bearishness yet, the 1.318 support level is technically holding. Longer term, while we do also have a lower bias, we have a potential pivot around current lows, so one should remain careful. The 1.324 level is too close to be considered as broken particularly in this volatile environment. If short, stops should be tightened. ER: Still quite bearish and heading towards [437-441]. We are still in a "failed recovery" mode, which often turns positive later on (e.g. Cup&Handle pattern) so no panic just yet, and buying opportunities will come up soon (Fib retracement levels). ES: Quite bearish here too and while entropy seems to have bottomed on the 60mins chart, we have to wait for a support to be confirmed either around current stall level (~828). 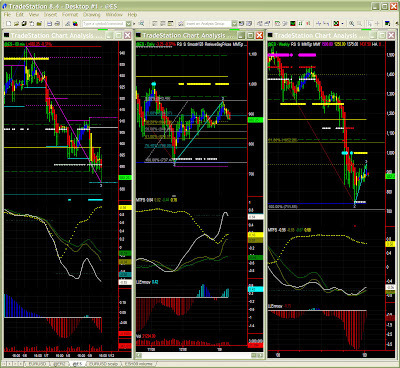 On the daily chart, we do notice also a potential pivot point which will take a couple of days at least to materialize. We may therefore see turning points soon... Could that be a "Obama effect" ... ? End of this relatively uneventful week. EURUSD yesterday turned lower but didn't quite reach 1.35 then bounced again. I mentioned this short was counter-trend so conflicting forces always make it more difficult to predict exact turning points ahead of the trading day. EURUSD anyhow followed a Fib pattern exactly to its 1st target at ~1.38 to then retrace again. The situation is the same today with a short term upper bias so we may be near the landing zone mentioned in previous report from which the US$ would weaken again. ER: short term upper bias seems blocked around the 500 key level and as we mentioned a potential airhole (daily chart) we have to remain careful here. However there is still some buying pressure here which could take prices away from this hesitation zone. 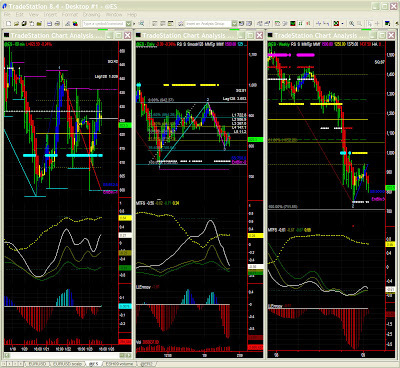 We'll cautiously follow Fib targets on the 60mins chart for now. As usual these days, we complement our short term outlook with a tick/volume chart. Obviously it is not quite compatible with a daily/weekly report but gives a better perspective to the 60mins chart, and i invite users of this technique to build their own mix of charts with the same indicator set. So, what happened yesterday? First EURUSD had to make me lie by a few pips... 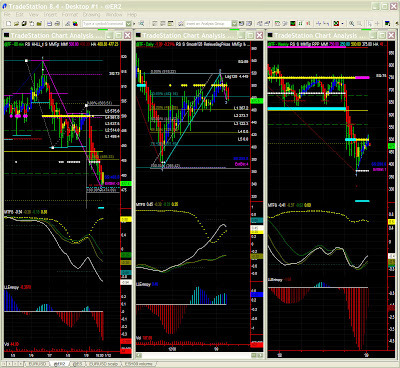 I was targeting 1.33 (1.33057 to be exact) and the market bounced on 1.33119 ... Not quite an exact science, isn't it ? Anyway, the market bounced to a first Fib retracement target to pause there. 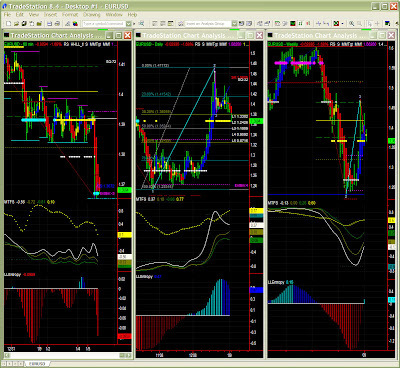 EURUSD could retrace to the low 1.34s in the short term (tick chart). 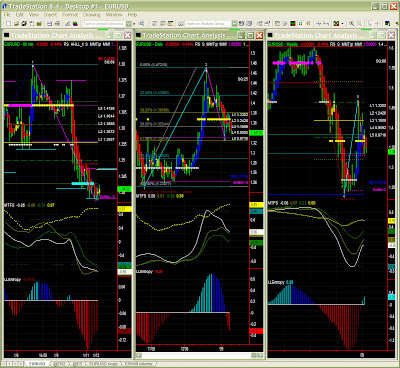 Longer time frames seem to show EURUSD looking for support to probably shoot higher later on. 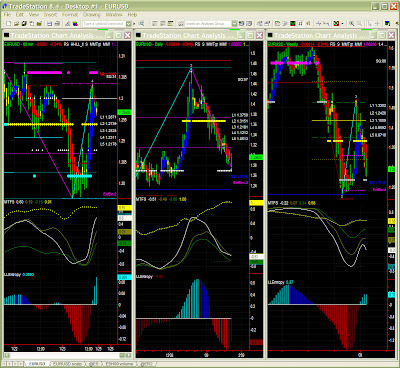 Yesterday was "back to school - back to reality" and i expected more movement on indices and maybe less on EURUSD. We do have ER holding just above 500 i.e. between MM and a Fib target, quite overbought, yet we don't know whether it can hover there much longer or is there a airhole coming. Technically, it could hit high 510s before retracing. ES follows a very similar pattern, i.e. could reach 937 if only energy wasn't getting low. This often happens that apparently obvious targets neverg get hit, and we can find confirmation on our volume charts where 930 is a both a Fib target and a stall level. However, the upper bias is still quite visible there so we shall not rush into conclusion of an imminent retracement. 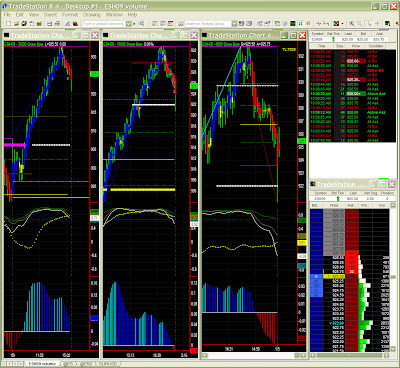 We also notice again the unusual Daily MTFS with the white line frontrunner. It hasn't reached overbought level yet, but even if we won't probably the well known bell shape MTFS indicating a clear recovery failure, we might see a variation like a double hump with more or less the same results. Again, let's wait & see how this develops. Now back to EURUSD, where we are seeing the most interesting action. Again, i thought the 1.367 level would hold, maybe because i sometimes read level i can quite believe myself. The daily chart indicates a price stabilization on a close support level but that scenario is battered by the high level of volatility and the 1.33 Fib target is not that far-fetched anymore and on the contrary is now becoming quite realistic. This doesn't change our longer term outlook on the weekly chart. This can be confusing for some, but this is still a counter-trend trade for long term players. Here too, ticks charts provide a pretty good picture. It certainly wasn't exactly the easiest exercise to predict EURUSD over the New Year's break, but i did nonetheless give it a shot, and again i have to admit that i somewhat underestimated volatility on my Wednesday morning chart. I gave a recommendation for a low potential short which proved more than OK as EURUSD is now reaching its target on pivot level (Daily chart). AN OVERALL VERY GOOD TRADE ! It will now be very interesting to see where it will find enough support (probably around current levels) to then bounce back (the weekly chart still points upwards). Obviously, this kind of report remains a little off-topic as it concerns mostly those who do run the toolset locally on their machine. Last week, i mentioned prospective Fib targets without realising one minute we could be there already... Yet, recovery may be relatively limited in the medium term (longer time frames). ES 60mins: Upper bias is still there despite our targets having been hit yet, a slowdown looks necessary even if we don't see it clearly just yet. 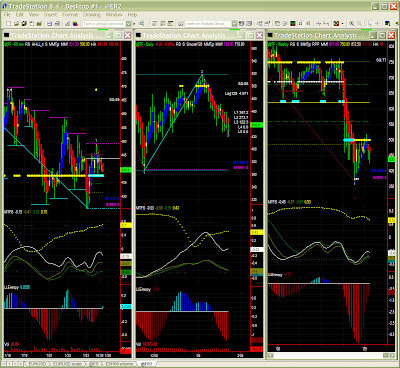 It may happen near the 937 pivot level and we might want to take a look at volume charts for accurate targets. 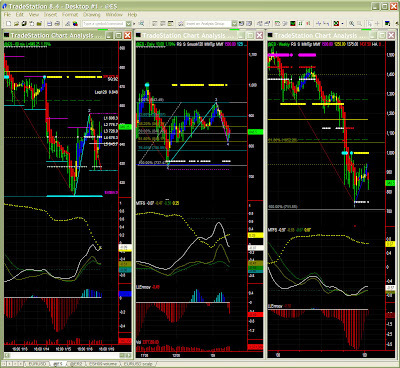 At this time frame, we certainly remain long for now, with stops tightened a bit near close Fib retracement levels. ES Daily: We here have the same hesitation as with ER with the MTFS white line going its way as a frontrunner without much support. We may therefore end up with some retracement or return to the same channel. We'll however give the current upper bias a chance particularly if volumes start coming in. As a matter of fact, we do again recommend long volum charts like 32000V for a clearer direction. ES Weekly: No change from last week AGAIN, and similar to ER: Swing is up and Entropy has bottomed yet MTFS is not too bullish so one does not anticipate any significant take off, and after all one has already enjoyed a significant 25% recovery since recent lows, so a pause and some profit taking would be quite in order. Since this weekly report is always based on the daily chart, i wish to remind readers that visibility on that chart is generally limited to abotu 3 bars, sometimes more, often less, particularly at times of high volatility. This last week was special also on account of the mid-week break, low volumes and the usual "window dressing" with portfolio managers adjusting positions for reporting on Dec 31st and Jan 2nd. Again we warned that the 60mins time frame (as well as lower intraday in fact) was the dominant time frame so we picked up the nice up move on Friday. EURUSD: the 60mins chart does no longer give us clear indications except maybe the continued hesitation around 1.39 with a strong support level only weaking a little to pivot level. Technically this only tells us that the US$ could bounce from here... or gain further ground. Should it go that way, we already have a prospective Fib target which corroborates a scenario of a lower support level on the Daily chart. 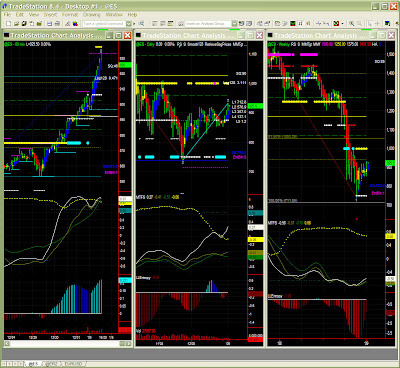 On that chart, Fib retracement level is around 1.38 and MM pivot level a little lower. Obviously we always prefer when they concur, but the general trend is there. Furthermore, the MTFS pattern indicates a "slow landing" near current levels although it could later on also turn to "erosion". In such case, support would be even lower. The Weekly chart is still moderatley bullish. One could see the current dynamics motivated by expectations of ECB cutting rates mitigating the fall of the US$ in the coming couple of months. 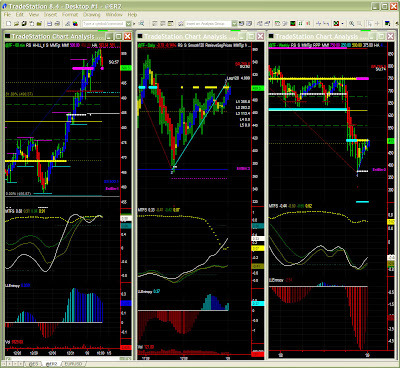 ER 60mins: This nice ride to 500 wasn't visible when the week started even if we had a possible Fib target around 510. 500 remains a strong psycholigical level where we see energy weakening a bit. We don't see any significant retracement coming right now though. MTFS indeed shows some resilience in overbought territory. A drop to first Fib level below 490 is however possible. ER Daily: Similar to last week, we are a bit uneasy about the configuration with the MTFS white line going its own way, with little or no support from the rest of the troop. Are we going to see the green and brown lines rallying or will the frontrunners run for cover...? Such hesitation is understandable on key levels, particularly after a period of low volume. So again, we shall remain very cautiously long here. ER Weekly: No change from last week AGAIN (cf. reports Monday 22nd and 29th). Entropy certainly looks a lot better but MTFS had an early crossover generally indicating a failing recovery hence should pull back before going higher later on. Like mentioned last week, buyers can maybe wait a little longer, or enter preemptively on an aggressive limit price or wait for a consolidation and buy market later on.